Für mehr Informationen zu diesem Thema in Deutsch siehe meinen Artikel “Stream das BLOB” im dotnetpro Magazin 6/2012. 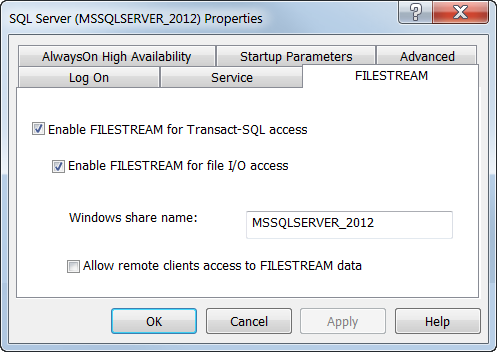 With FileStream SQL Server 2008+ stores BLOBs in the NTFS file system instead of its table store and offers fast streaming access. This post shows how to manage FileStream BLOBs via the Entity Framework (EF 4.1) DbContext API and how to stream them via Windows Communication Foundation (WCF). Store BLOB in a DB table. Store BLOB via FileStream in NTFS. Store BLOB via FileTable in NTFS. Store File in NTFS with a reference to its path in a DB Table. If you prefer to manually store your BLOBs as NFTS Files consider adding transaction support, see Using Transactional NTFS (TxF) with SQL Server in .NET. BLOBs are stored in NTFS. 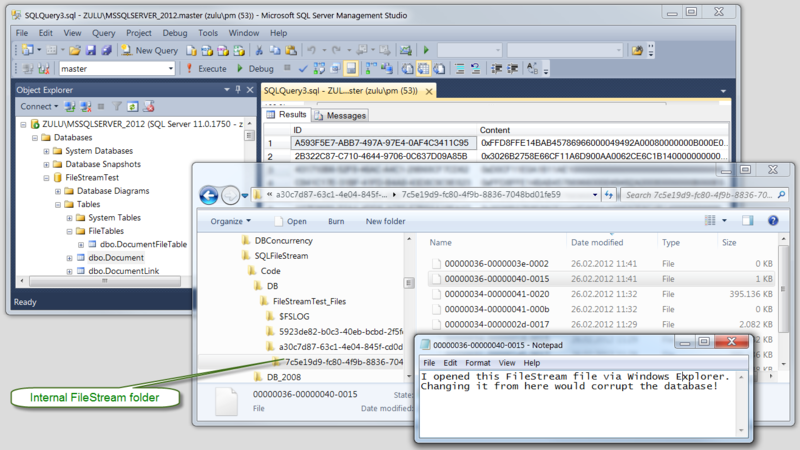 Access via SQL and fast Win32 streaming . Consistent data recovery via full Backup/Restore support. 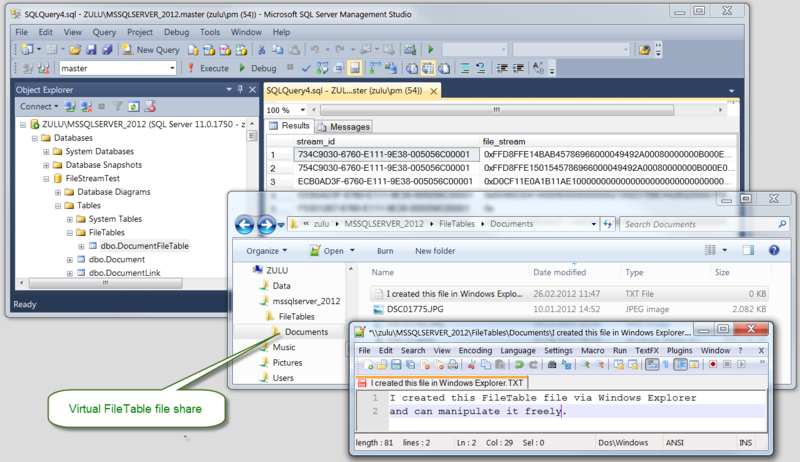 SQL Server 2012 FileTable exposes the FileStream BLOBS via an NFTS share. This enables users to mange (create, read, edit, rename, delete) the BLOBs stored in SQL Server via Windows Explorer and applications to manage the BLOBs via the standard System.IO API. While access via the NTFS share is non-transactional, you can still access the same BLOBs transactionally via the underlying FileStream. 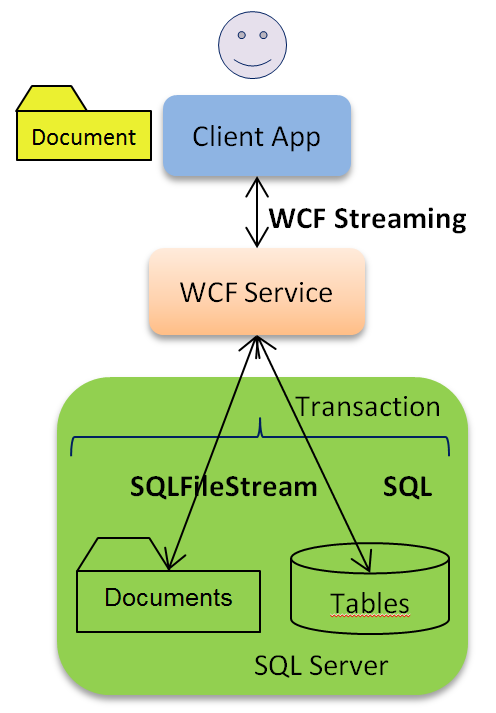 The sample application uses a 3-layer architecture: WPF Client, WCF Service with streaming over NetTcpBinding and SQL Server with FileStream. 2-layer architectures are generally a bad choice, because they allow end users to access the data bypassing application logic (see Beware of End-User Permissions in Databases). Specifying the FILESTREAM attribute on a varbinary(max) column causes SQL Server to store the data in the local NTFS file system. To be updatable via Entity Framework the ID must be PRIMARY KEY, UNIQE is not sufficient. If a message contains a stream it must be the only parameter in the body. Thus the other parameters are defined in the message header. For best performance the service accesses the BLOBs via the SQLFileStream class and not via SQL. 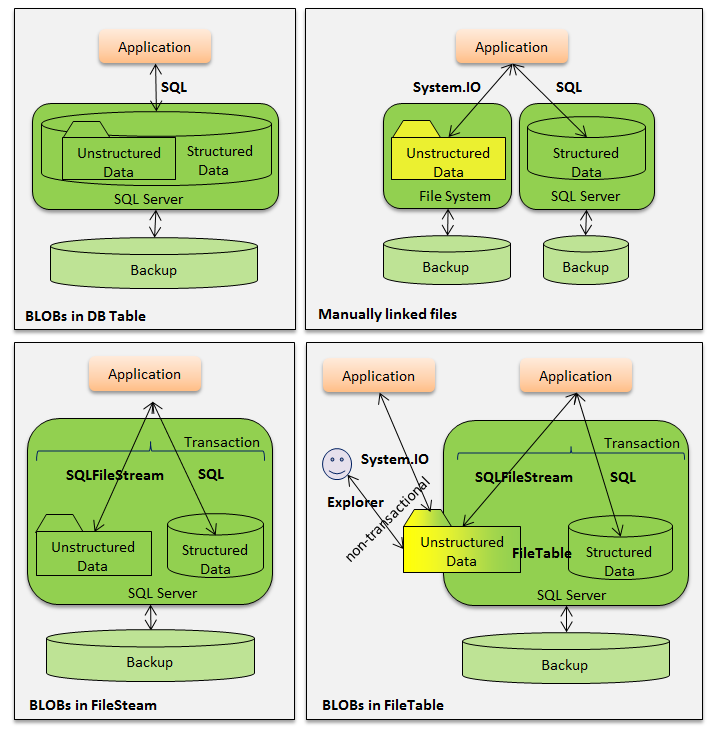 SQLFileStream can only be used within a transaction. For downstreaming the BLOB (see Function GetDocument) we defer closing the transaction to the Dispose method. If you dislike tying the transaction length to the length of client operations you can alternatively return a copy of the BLOB stream. Depending on BLOB size this may cost a substantial amount of service memory. For best performance we use NetTcpBinding. To protect against denial-of-service attacks MaxReceivedMessageSize must be specified even with streaming. MaxBufferSize only applies to the message header. To avoid blocking the UI thread, synchronous service calls are made via Task Parallel Library (TPL) tasks. To allow the completion code to update the UI TaskScheduler FromCurrentSynchronizationContext is used. Enable FileStream with streaming access for the database instance. Create a filegroup for FileStream data. Create a table with a varbinary(max) column using the FILESTREAM attribute. This entry was posted in Computers and Internet and tagged .NET, ADO.NET, Architecture, Database, Entity_Framework, SQL_Server, Transaction_Scope. Bookmark the permalink. what happens when _downloadSqlFileStream is not closed but DocumentService is disposed?? My sample service implements closing the connection in via IDisposable (see sample code). The service is configured with InstanceContextMode.PerCall, thus the service instance gets disposed (and the transaction closed) after the client call completes. You can verify the behavior by tracing. I you try to close the connection in GetDocument with a large document you will receive an WCF error “connection unexpectedly closed” because it will be closed while the client is still downstreaming. Until a CommittableTransaction has been committed, all the resources involved with the transaction are still locked.